The FTA will provide the U.S. construction industry with greater access to a dynamic and growing budding market. Canada has a population of about 10 percent of that in the US., but a construction industry that is 17 percent of ours. This greater per capita expenditure on construction probably stems from two factors. First, Canada's population is distributed over a greater area and has a lower density, requiring a greater commitment of funds to the construction of highways and other services to link its population. Second, the northern climate of Canada typically requires more substantial, weather-resistant buildings. This is an encore of an article Michael Chusid wrote two decades ago. In retrospect, the tone of the article sounds like it was written by a Chamber of Commerce. While the two countries do have extensive trade with each other, and ideas and finances move across the border with ease, digging in the dirt remains closely linked with a particular region, and cultural and trade patterns remain obstinate. Updates are shown below in blue. Because most of Canada's population lives within 200 miles of the US. 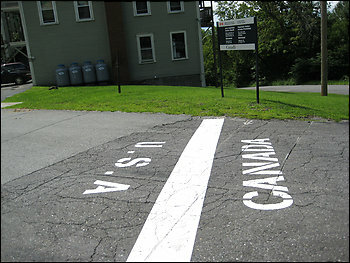 border, Canadian cities are often closer to major U.S. cities than they are to other Canadian population centers. Toronto, for example, is closer to both Detroit and Cleveland than it is to Montreal. This should make the distribution of building products move more in a north-south than in the east-west direction of current Canadian commerce. Also, many of the building-product manufacturers who currently maintain separate companies on both sides of the border may now find it economical to consolidate their operations. In the building industry, such multinational operations could make it increasingly difficult to specify products on those publicly financed jobs with a "Buy American" clause. Boral is one company that divides it trade regions by longitude, not latitude. While some companies will undoubtedly face painful new competition due to the FTA, the U.S. building industry will benefit from the agreement. Abroad, we will have greater access to Canadian markets for goods and services. And at home we will enjoy an expanded choice of materials and reduced prices on imported products as we see "Made in Canada" on more building materials. Are Toll-Free Phone Numbers Obsolete? A toll-free phone number used to be vital for most building product businesses. Long distance charges were high, so the free call made it easier for out-of-town prospects to dial in. Having an 800 number was also perceived as a red carpet that made customers feel welcome. But times have changed. Competition among long distance providers have caused prices to tumble. Many callers have unlimited service plans that do not charge extra for long distance. Voice Over Internet Protocols (VOIP), Skype, and other internet-based telephones are virtually free. An increasing number of sales inquiries come via e-mail rather than by phone. And toll-free numbers aren't useful in for calls from international clients - an increasingly important part of the construction business. With this in mind, one of my clients just eliminated their toll-free number from their website. What do you think? Is it still important for a building product company to publish a toll-free number? I would love to hear from readers with thoughts about this. The ANZAC/British/North American architecture profession is not in the best of shape. This is no mere economic hiccough: it is a fundamental structural change. There are two effects operating (oh us, this is the sociologist talking!). First, there is a replacement effect. Things that architects did thirty years ago, they no longer do. Like manage big contracts for construction. A whole bunch of new occupations have been created to do that, such as 'project managers'. True, some of these people have architecture degrees, but a lot do not. Second, there is a substitution effect. Whenever something new has happened in the construction industry, the architects have decided 'it wasn't for them'. Here is one example: security. Thirty years ago, 'security' meant the locks that the architect said had to go on the doors. The architect was in complete charge of this, choosing appropriate items from catalogues. As you probably know, today 'security' means cameras, photo IDs, swipe cards, lift (elevator) control, and goodness knows what else. That is in the hands of specialist consultants. The specialist tells the architect what can be done, not the other way around. Here are a few indicators of the decline of the occupation. Let's take a look at the world's best weekly architectural journal, the Architects' Journal, known fondly as the AJ. This is a British journal that even the American architecture schools collect. Bristling with not only great technical stuff, but also industry gossip, plus some of the high-art fluff some like. A wonderful collection. When Dr Garry was a student, he worshipped the AJ. We did a bit of investigating. Ten years ago (1989) it published about 6,000 (six thousand) pages each year. In 1999 (the last year we have) it only put out 3,200 (three thousand two hundred). That's a 45% drop. Holy dog-doo, Batman! Sure, a lot was advertising, but in a sense that is the point: when sellers decide you are too poor to sell to, you might as well pack your bags and migrate to Albania (no offence to all my Albanian readers, we am sure). Second, let's take a look closer to Dr Garry's home, by seeing what Architecture Australia has been doing the past decade or so. This is the organ of the Royal Australian Institute of Architects (RAIA). Like the AJ, Architecture Australia has published less and less as time has gone on. In 1988 this journal published nine issues with a total of 1,220 pages. Ten years later, it only published six issues with a total of 558 pages. Again, a huge 54% fall. We'll finish by noting some North American indicators. The Canadian Architect fell from printing 752 pages in 1989 to printing 597 in 1999, a more modest 20% decline, but a decline nonetheless. The situation in the United States is a little more complicated. In the late 1980's the Big Three of architectural journalism were Progressive Architecture, Architectural Record, and Architecture. Of these, only PA had any guts. The rest were surrogates of the American Institute of Architects, and publishers who wanted to sell, sell, sell. After a series of genuinely thoughtful, critical pieces, PA folded. If we include the extinction of PA, then US architectural journalism has declined by about 30% in the past decade. You can read more about this phenomenon in this November 2006 article in Slate.com, by their excellent architectural commentator Witold Rybczynski. We are in the process of examining architectural employment and incomes in the United States as a whole, but for the moment we have some interesting data from California, obtained from the Fall 2000 Newsletter of the California Architects Board. In 1989, the figures show, 15,248 people sat for one or more portions of the Architects Registration Examination in California. In 1999, only 3,720 did. In 1989, some 1,339 initial licenses to practice were issued. Ten years later only 362 were. Now for some figures from Dr Garry's own Australia. In every country, employment in architecture depends very much on the business cycle. This has always been a leading indicator of economic health. Since architects are engaged months or years before construction takes place, measuring employment in architectural offices gives you a good way of predicting what is happening in the construction sector of the economy. Since construction is so large a part of any industrial economy, this also gives you an excellent leading indicator about what else is happening. What has us spooked is that, since 1989, employment in Aussie architecture firms has fallen by 20%. Whoa! Full details can be found courtesy of research published on the Royal Australian Institute of Architect's website (nice to see the RAIA does at least one useful thing). If the number of architects had grown as the rest of Australia's workforce, we should have about 15% more architects, not 20% fewer. Surely these are significant developments in the status of the architecture profession. If the data is as we interpret it, then the architects' associations should be showing some concern. We've sent a few emails asking various august bodies about their opinions on this matter, but almost no responses. Either no one else has noticed; or no one else cares. Copyright © 2001–2010 Garry Stevens. All rights reserved. Original research on this site is commercial-in-confidence and copyright © 2001–2010 Garry Stevens. It is not public domain. Notwithstanding all this legal palaver, you may freely quote any research on this site or other material to your heart's delight; provided proper attribution to Dr Garry and this site is given. This domain name is proudly registered in the USA, and the website is maintained on servers in the USA. Many building product manufacturers are mesmerized by China. The land of cheap manufacturing. The largest construction market. Boundless potential. Of course, it is also a land of boundless risks. But the more you know about China, the better you can assess the opportunities and risks. Recently published, The China Greentech Report 2009 report offers insight into the nascent but growing market for environmental products in China. One of the industry sectors covered by the report is the nascent but growing market for green buildings. The complete report can be downloaded at http://www.china-greentech.com/.